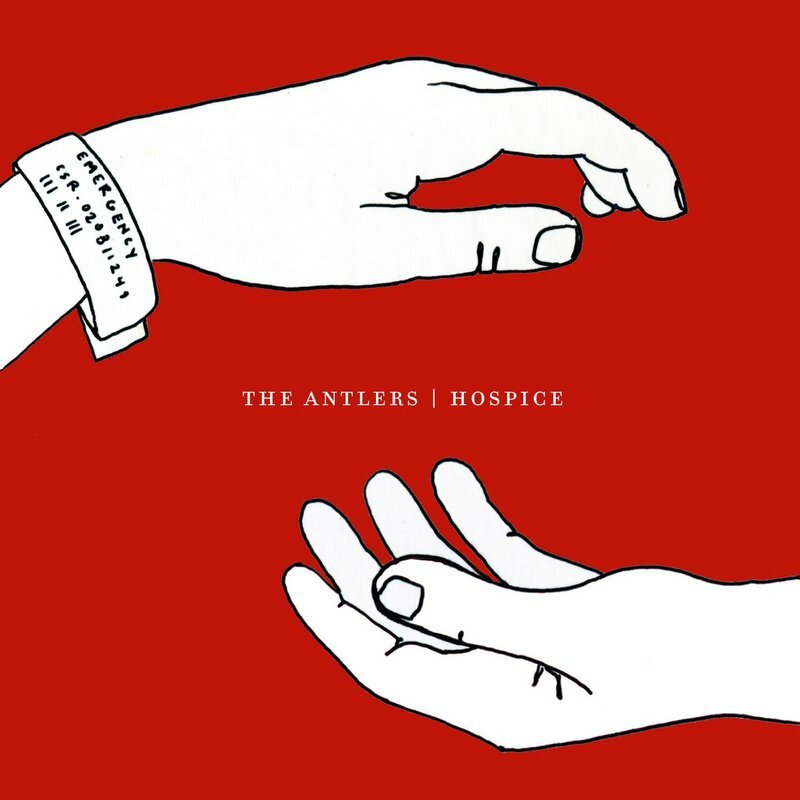 I’ve been meaning to post something about The Antlers’ fantastic debut, Hospice, since I stumbled across a copy of the original release on the band’s own label, but other things kept getting in the way. By rights I should have mentioned it in my list of my favourite music of 2009, but since then they’ve gone on to rather bigger and better things, with Hospice picked up and rereleased by French Kiss Records, and rave reviews around the world. What’s fascinating to me about Hospice (aside from the fact it’s completely thrilling) is its self-conscious literariness. Rather than craft a series of individual songs, Antlers front-man Peter Silberman uses the album’s ten tracks to map out the intense and conflicted feelings surrounding the death of the narrator’s young wife from bone cancer. It sounds bleak, but isn’t. Rather like John Darnielle of The Mountain Goats’ equally fabulous album about his troubled adolescence and abusive stepfather, The Sunset Tree (one of my all-time favourites) much of Hospice’s brilliance lies in its refusal to sentimentalise or mistake indulgence for integrity. But whereas The Sunset Tree is based in real experience, Hospice is essentially metaphorical, a work of fiction drawn from Silberman’s imagination. And, as a result, it manages to retain both a degree of allusiveness a more overtly confessional work would almost of necessity lack, and a coherence and shape a simple series of songs could only dream about, offering a journey through confusion and pain to loss, and finally, and improbably, a sort of catharsis. You can buy Hospice on Amazon , iTunes or via online retailers such as Chaos. I am a major fan of John Darnielle and The Mountain Goats and will give this album you recommend a listen. Have you come across the alternate, demo recordings and B-sides, entitled ‘Come, Come to the Sunset Tree’? It is fantastic version of the original album. The Sunset Tree’s a remarkable creation, and probably one of the albums I’ve listened to more times than any other in the last few years, so I’m glad it has other fans. And embarrassed to say I don’t know the demos album, but I’ll try to track it down. Thanks for the tip! Have bought this album on iTunes. James, I’m thrilled to hear you’re a fan of The Antlers’ ‘Hospice’. It’s a terrific record from beginning to end – there’s a bit of Jeff Buckley there, some 90s shoegaze, some great lyrics, and, as you say, an appealing narrative arc. My only criticism is the annoying stop-start between songs, as if it was originally mixed so each song merged into the next but someone put in a two-second break between tracks. Does anyone else have this problem? PS I have a policy of only buying great albums on vinyl. I will be buying ‘Hospice’ on vinyl. PPS Why do I keep typing ‘his piss’ when I mean ‘hospice’? PPPS For those who adore The Antlers, they probably should check out Frightened Rabbit. Just as grand. Totally know what you mean about the gaps between songs. Was thinking of sending mine back, convinced I’d got some dodgy copy of the album by mistake. Glad to know now it’s not just me! All great minds think alike, obviously. Will check out Frightened Rabbit.